The monster does not come walking often. This time it comes to Connor, and it asks for the one thing Connor cannot bring himself to do. Tell the truth. This is a very touching story about a boy who feels very damaged, guilty and mostly angry. He struggles at school with bullies, and pity looks from everyone, and at home with his mother’s sickness. Will Connor overcome his problems? Will everything be okay? Will Connor be able to speak the truth? “I will tell you three stories. And when I’m done with my stories, will you tell me a fourth. I don’t know any stories. 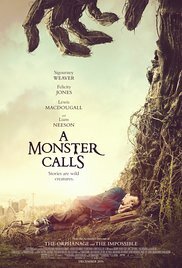 I’m not easily impressed and rating a movie with a maximum score is an oddity for me, but the impact of “A monster calls” on me was unprecedented. And not only because of the deeper meaning behind the story of young Conor and his terminally ill mother Lizzie, but also because of the brilliant performances of Lewis MacDougall and Sigourney Weaver (Conor’s grandmother), the modest acting of Felicity Jones, the sometimes masterfully used special effects and the three profound stories told by the monster with the impressive deep voice of Liam Neeson. It’s not really surprising it turned out to be an emotionally charged story. Only the emotional parts are so pure and humane that even I, who usually looks at such moments soberly and dry-eyed, got a lump in my throat. But especially the denouement gave the story a mysterious turn. Overall, a fantastic film that deserves the maximum score. When I say I have an unspeakable admiration for the young actor Lewis MacDougall, you can safely say it’s a huge understatement. This young boy has such charisma and naturelle. Why this film was not even nominated for an Oscar, is for me a complete mystery. The emotions young Conor is going through, are so diverse and he displays them in such an obvious way. I can only conclude that he’s a natural acting talent. The character Conor handles a wide spectrum of emotions. From rage and anger, to some brief happy moments. From fear and despair, to courage and determination. And finally the immense grief after the loss of a loved one, the letting go and the acceptance as central themes. All this is brought by this young actor convincingly. Respect. The film tends to place itself into the fantasy corner, with this huge yew tree that moves around in a destructive way. It reminded me of one of “The Ents” from “Lord of the Rings“. The same appearance. The same voice full of wisdom. The only goal this creature out of Connor’s fantasy has, is to make it clear to him that life isn’t always rosy or easy, and that he’ll be confronted with difficult moments during his life. Conor’s life on the other hand isn’t so rosy and he faced already some terrible events in his short life. A fatherless upbringing, a terminally ill mother and the terrible bullying at school. Situations that cause him to enter a psychological whirligig with terrible nightmares as a result. Nightmares in which he consistently tries to save his mother, while she threatens to disappear into a huge crater. And always the nightmare ends with him not being able to save his mother. You don’t need to be Freud to know the deeper psychological meaning of that dream. Some will say perhaps “A monster calls” belongs to the category of youth movies. However, I don’t share that opinion. Even though the tree monster looks intriguing and not too creepy. And those stories are presented as with water-ink illustrated fairy tales. Nevertheless, the ultimate message is of a more mature nature. The fairytale stories have a rather sinister undertone and deal with deception and guile. They are telling the story of the complex human mind. I’m afraid that children will only see the fairytale of the tree and won’t understand the deeper meaning behind it. I even wondered if there wasn’t even a hidden story behind the main story? Wasn’t the man next to Lizzie, on that picture hanging in that room in the end, Liam Neeson? And what about the content in that sketchbook that Conor is looking at in the end? And how come the monster turns up at 00: 07 from the beginning on? When all the pieces fell into place in the end, it felt as if it opened a completely different dimension. After that I could only gaze at the screen while feeling numb and confused. What is it that makes a movie to reach perfection? It’s not just because of the matchless imagery. And not only because of the wonderful performances. Or that beautiful story. But also because of the effect a movie has on me. “A monster calls” has all these features and especially the last item. So, I call this movie perfection.